I've always been a hard worker, but I got to a point where I had to step off the hamster wheel of perfection and give my mind a break. Let’s call it life’s hamster wheels. In school, work, relationships or marriage, we often default into a repetitive sequence of daily rituals or habits. And we do them over, and over, and over. Again. We’re led to believe that showing up in these particular ways, these socially sanctioned but not always personally deeply examined ways, will give you happiness, that special job, the amazing spouse, the car or that prime piece of real estate. All of this is a fiction. It was at this point in my talk that I reintroduced myself. There was the requisite throat clearing. There was the pregnant pause. And then the words started to really flow. Hello, my name is Brian, and I teach yoga and meditation and have been practicing them with devotion, humor, and compassion for nearly 25 years. All situations have a beginning, a middle and an end, but we often attach ourselves to a specific outcome for each of these three segments. This always leads to suffering. Here’s a simple example that’s relevant to students specifically. You’ve enrolled in several courses this term; you’re probably somewhat attached to doing what it takes to earn good grades. 1. Stand up from your seat. Your choice of seating can be limiting on your space; challenge yourself to see how your space in a different way. 2. Now close your eyes and observe your breathing. Watch the movement of your in and out breaths. You’ll start to feel both weighted and lighter. 3. Cultivate mindfulness, that is, practice non-attachment. Label your thoughts. While on the hamster wheel, it’s likely that you will gravitate to habitual thoughts, mostly about the past or future. While watching your breath, can you label these discursive thoughts and come back to the breath when those thoughts surface? 4. Be in transitions. Here’s the 360 part. Slowly open your eyes and “walk” slowly in place, by turning your body 360 degrees over the course of five full minutes. While “walking,” keep with your breathing and notice your environment without looking at it with any attachment. For example, as you “walk” you might see a baseball cap and then think about where you got it, then the game, then who you were with: Break the story line by just seeing the baseball cap, label the cap “thinking,” come back to the breath, and move on. Doing this will help you see your environment more fully, clearly, and presently and recreate a relationship between you and it. This can be done nearly anywhere. 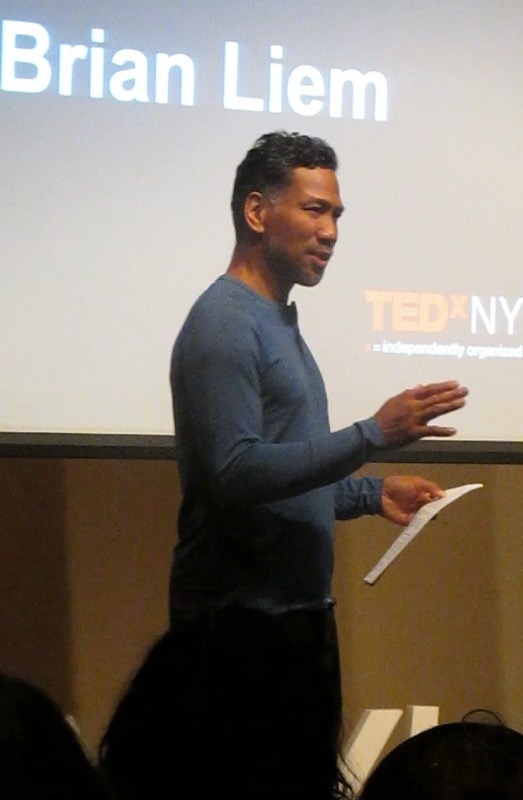 Brian Liem is a yoga and meditation practitioner, teacher, mindfulness coach, author, husband and dad living in New York city.